The user isn’t the product being sold. The user is the customer. Startups become big by empowering their customers with great products and services that allow them to do things that were previously difficult or impossible. A company is a group of people with a shared goal. Everyone deserves a chance to make progress on meaningful work. You aren’t Steve Jobs, so don’t be a jerk. Meetings are toxic, but necessary. Manage them in a constructive way. Everyone must bring something to the table. There is no room for “ideas guys”. This is an exciting and experimental new role in which Ben will work with and across the festival set to spot and develop project opportunities and bring his expertise and experience to explore what it is to be a festival in the 21st century. The Edinburgh Festivals include some of the world’s largest arts festivals – twelve in all – and I’m hugely excited to be part of the mix. Long-term readers will know that it’s not technology as such that excites me, but the human impact of technology – and what could be more human than a set of international arts events that spans the breadth of what global culture has to offer? The Edinburgh Festivals Innovation Lab is a new experiment and resource for the twelve Edinburgh festivals to explore how they can use digital technology to create new value for audiences, artists, the city and the festivals themselves. Over the next two years, the twelve festivals will work together and with a wide range of partners to identify, develop and prototype high potential projects which use digital technology to improve the festival experience, for audiences, for artists, for the festivals themselves and for everyone. We recorded a short interview on Wednesday that serves as an introduction to me and my background, but also why I’m so excited about working with the arts in this way. 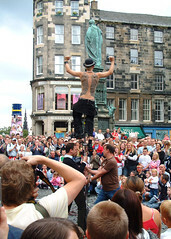 Photo: Edinburgh Festival by Bex Ross, shared under a Creative Commons license. Note: As of 2011, this is no longer true. Enough people have asked me about this over the last year, that I thought I’d write a little more about why I don’t do social networking work. I also co-founded Curverider, the company created to provide commercial Elgg support, which allowed us to build it into the project it is today: an enormously popular social networking platform used by organizations like the WWF and the World Bank. For various reasons, I chose to leave Elgg and Curverider last year to go freelance and work on some of my own projects. (The last version I was involved with in any way was 1.5 – since then I haven’t been privy to development decisions or involved in the process.) Because of this prior association, however, people still ask me about working on social networking projects all the time – whether that’s a distributed social network, a new platform, or an Elgg-based site. My answer is always the same: I’d love to, but I can’t. As you’d expect for a founder, I’m a shareholder in Curverider. As part of this, I am forbidden from competing with the company’s business (which, of course, is social networking – a rapidly growing portion of the entire software market, but that’s a conversation for another time). 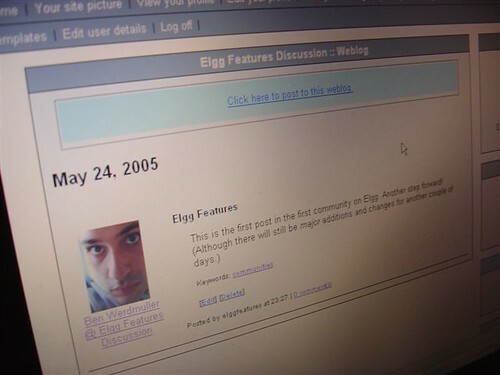 As a result, I don’t work on social networking platforms, and I’m unable to provide Elgg services, despite it being an open source framework. A process exists for me to obtain an exception for potentially competing products, but this would involve divulging the project and business model, which I don’t believe is an ethical way to treat a consultancy client’s information. So I don’t do it. Of course, I’m available for web strategy advice, writing opportunities and development services in a range of other areas, including publishing, e-learning and mobile content. I’m also developing a few new ideas that you should see in action soon. As ever, if you’d like my feedback, please feel free to get in touch. Have you ever looked at a piece of social software and thought, or worse, blogged, that it was worthless? Here’s a trick for evaluating social software in a way that isn’t going to make you look stupid six months down the road: assume it’s valuable if people are using it. Then try to figure out what value they’re getting. I’ve lost count of the number of times I’ve heard people be dismissive about Twitter, or Facebook, or another well-loved web tool because they didn’t understand it. I’ve even been guilty of it myself – but it’s not productive. Much better to figure out why people love it and learn from what you discover.